Kirk Rudell is a writer and producer based in Los Angeles. This essay was adapted from his recent Twitter thread. The day of the recording, I walked to the booth to meet Fahad and direct his session. It was just a couple lines, so I figured I’d say hi, run it a few times, and we’d both be on our way. Fahad was standing with a woman, whom he introduced as his wife, Loujain. She didn’t know anyone in LA, so she was tagging along with Fahad for the day. They were young, cool, cosmopolitan and incredibly nice. I liked them right away. We chatted. I asked Fahad about being a Saudi comedian — about doing something that didn’t exist before in his country. I had recently met with Trevor Noah to talk about a project, and he spoke about growing up in South Africa without access to Western pop culture. So he never internalized the standard rhythms of stand-up comedy — he and other South Africans created their own. Fahad was fascinated. Yes, he had had a similar experience. But his voice was also shaped by the fact that comedy in the kingdom was . . . dangerous. So now we dipped into politics. I mentioned the young, “progressive” Prince Mohammed bin Salman. All the press in the United States seemed pretty positive about the guy. He was meeting people in Hollywood and Silicon Valley. Were Fahad and Loujain feeling optimistic about the future of Saudi Arabia? They were hopeful but warned there was still a long way to go on human rights. Which is why they’d recently moved to Dubai in the United Arab Emirates. “Huh. Well at least you know you’re safe,” I said. With literally millions of fans, he was too high-profile to mess with. I looked at Loujain. “And his fame covers both of you, right?” They looked at each other. “Oh, she’s much more famous than me in the Middle East,” he said. And then I realized who she was . 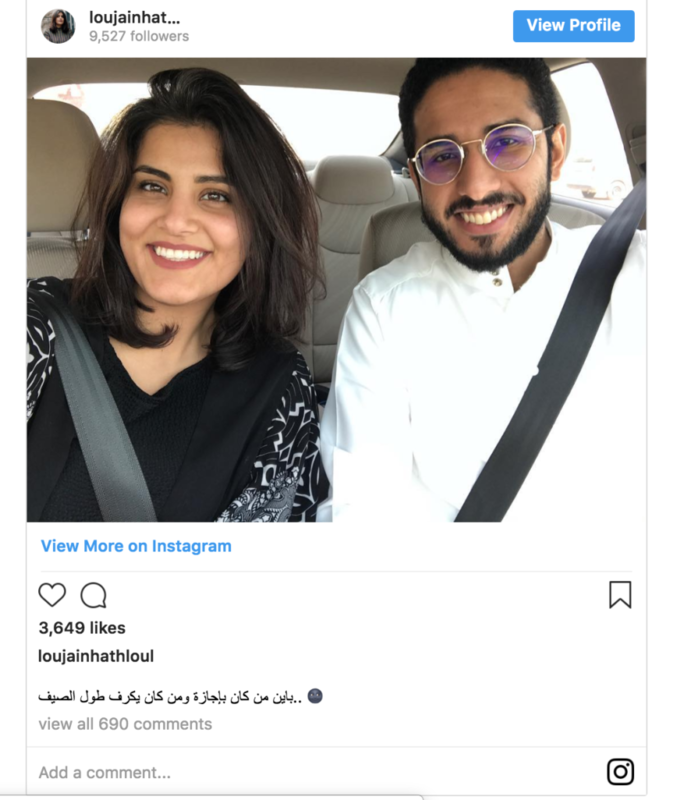 . . one of the women’s rights activists who had been arrested for driving in Saudi Arabia. I felt like an idiot. I had assumed she was the sidekick when she had already, by her mid-20s, done more for human rights than I ever will. We talked about her arrests. The toll it had taken when, just after their wedding, she had been picked up again and “disappeared” for a few days. They felt somewhat protected by their fame. They were a window into a world I only knew through occasional articles far from the front page, and I could’ve talked to them all afternoon, but we had to do the record and get on with our days. We exchanged info. We made plans to have dinner while they were in town. We didn’t. Work, life and family got in the way. But we chatted occasionally over the next couple of years. Loujain was trying to launch a talent agency for actors, comedians, and musicians in the Middle East; I gave her feedback on her website. Fahad and I sent each other links to work we were doing...trying to make the gulf between our worlds a little bit smaller. In 2017, I read that Loujain was arrested and reached out to Fahad to see if she was okay. He answered that she was already being released. It was scary but fine. And then, last March, they were both grabbed, blindfolded, and taken to Saudi Arabia — Fahad from Jordan, and Loujain from the UAE. Ten months later, Loujain is still in jail; her father reported that she has been brutally tortured. I don’t know where Fahad is. He deactivated his Twitter. I can find no trace of him online since last spring. I read that they are no longer married. They weren’t trying to be revolutionaries, or martyrs. They were just young, creative people, trying to make stuff and share the same fundamental human rights. I’d like to see what they could do in this world, if they were given the chance. I’d like the government of my country to not take payoffs to look the other way at moral atrocities. With the Democrats in control of the House, I’d like Congress to have Fahad and Loujain in their thoughts. I hope that I can have that dinner with them some day.